The connection and sealing of cables to electrical equipment used within any industrial project is an important aspect of the safety and ultimate success of the project, but often a source of significant aggravation when things go wrong. This is none more relevant to anywhere else than in the mining industry, due to a wide range of compliance requirements that need to be met. Compliance with technical standards is of paramount importance as well as local electrical codes, wiring rules and other regulations which may be in force. The selection of cable sealing devices or cable glands is a safety critical process that users have to contend with and sometimes this is overlooked, as the item being chosen is considered less important than some of the major capital equipment. This can lead to compliance and safety issues when insufficient time and attention is devoted to the evaluation of the specific parameters of the selection process. The end result may be that projects inadvertently use a type of cable gland that was used by another site or project in the past, or even a one recommended by a supplier who doesn’t always have enough of the basic knowledge or expertise to make an informed decision. Ultimately, responsibility for the selection being correct lies with the owner operator or his primary contractor, if he has agreed to take on this responsibility, rather than suppliers. This is especially true when the operations involve activities in explosive atmospheres. So what are the issues that users may face when selecting cable glands for mining operations across a wide range of applications? First of all it should be recognised that cable glands are mechanical devices used to terminate and seal the ends of electrical and instrument cables. Therefore their function and whether the features in the cable glands that are used fulfil each of the requirements should always be fully understood, many of which are included in IEC 62444:2013 – Cable glands for electrical installations. CMP Products has developed an innovative and revolutionary sealing solution for barrier glands that delivers increased reliability, cuts time and cost whilst improving safety. RapidEx is a liquid pour, fast curing, liquid resin seal that installs in seconds and cures within minutes. Its unique formula begins with a low viscosity liquid that pours into the cable interstices, completely surrounding the cable conductors and displacing the air from the cable gland’s sealing chamber. 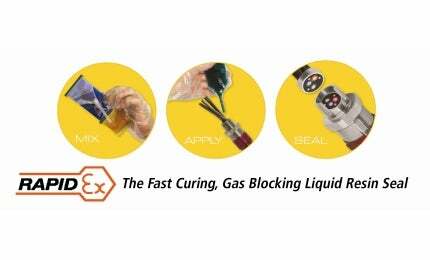 This eliminates the human error risks associated with clay compounds as, instead of being manually compressed down; using this liquid resin to naturally flow around all the cable conductors ensures a perfect seal. This enhanced accuracy of application allows for a fully reliable sealing solution. By embracing the needs of the industry and looking at innovations on how to address the difficulties of installers on various project and construction sites around the nation, a solution that uses liquid pour barrier resin has been developed that virtually eliminates the risk of incorrect installation. The result means that not only is the reliance on individuals to manually pack compound between the cable conductors taken away, the level of ‘right first time’ installations are enhanced several fold.